Rocks and Minerals by Zim, Herbert S.
Softcover has shelfwear to edges and covers, especially to spine area. Pages are tight and clean. PO name inside. 160 pages. SoftCover Binding. Year: 1957. ISBN: 0. 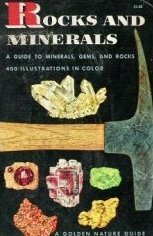 A guide to familiar minerals, gems, ores, and rocks enhanced by 400 full color illustrations. Provides much geological knowledge in how to look for surface forms, rocks, minerals etc. Includes information for the searcher and an useful list of clubs and organizations. Excellent bibliography and index. Allegiance by Green, Wayne L.